At the Credentials step of the wizard, specify credentials for a user account with administrator privileges on the management group. From the Credentials list, select credentials to connect to the management group. If you have not set up credentials beforehand, click the Manage accounts link or click Add on the right of the Credentials field to add the credentials. For more information, see Managing Credentials. 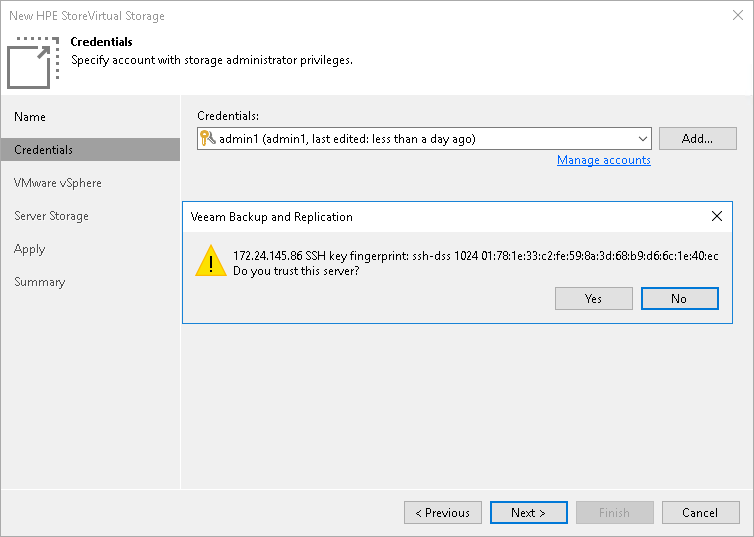 When you add a storage system, Veeam Backup & Replication saves a fingerprint of the SSH key of the management server to the configuration database. During every subsequent connection to the server, Veeam Backup & Replication uses the saved fingerprint to verify the server identity and avoid man-in-the-middle attacks. To let you identify the server, Veeam Backup & Replication displays the SSH key fingerprint.